I went and saw the new Ghostbusters recently. I was optimistic going in as I have enjoyed The Heat and his episodes of Nurse Jackie. After coming out of the theater, I will say that I loved the movie. I laughed, I cheered, and I came out wanting to see the movie again. The part that I enjoyed the most about this movie were the characters. In the same vein as the original, Erin, Abby, Holtzmann, and Patty each fulfills a particular role. We have the scientist, the idea person, the mad scientist, and the worker. Each actress embodies their role while also providing a driving motivation. Erin wants to be seen as a scientist while still believing in the paranormal. Abby wants to be able to pursue her love of the paranormal as a viable job. Holtzmann wants to be able to continue to create her bizarre technological creations. Patty wants to be a part of a group that values her and what she has to contribute. Each of these pieces seem disparate and disjointed. Like a pile of jigsaw pieces stack upon one another, the image is discordant. As the movie movie proceeds we get to watch as the pieces move about and shows the individual scene placed atop each one. Then we watch as they find their places among the other pieces to create an even larger picture. I enjoyed the action movie aspects of this movie as well. In this version of the Ghostbusters, we are presented with the group before they have perfected their craft. There is no containment unit so the ghosts that are trapped are stuck in the trap until they can develop something. The story progresses so that trapping the ghosts is not a viable option. Hotlzmann designs gadgets that will allow the group to deal with the threat in a way that is tailored to each member of the team. In particular, I love the ghost destroying cestus that are designed for Abby. They hit that action hero feel in the way that they are look and are used in the movie. An adrenalin pumping moment in the film. Holtzmann and Patty made me love this film as well. Holtzmann is the quintessential mad scientist. She is brilliant and weird and nice and unapologetic about all of these things. She comes up with the ideas for the gadgets that allow the group to do what they do but works well with the group to make sure everyone is prepared for what comes next. Patty is the strong outsider that is confident in her identity. She knows that she is not a scientist but understand that what she does know will help the group. She presents her knowledge and experience in a manner that demands attention and gains her the respect that she deserves. Neither are the driving force of the Ghostbusters but each, in their own way, makes it possible for Abby and Erin to keep the group going. I can identify with both of these characters. Ghostbusters gets four bear paws out of four from me. It blends characters, comedy, action and story to create a fun and entertaining movie. 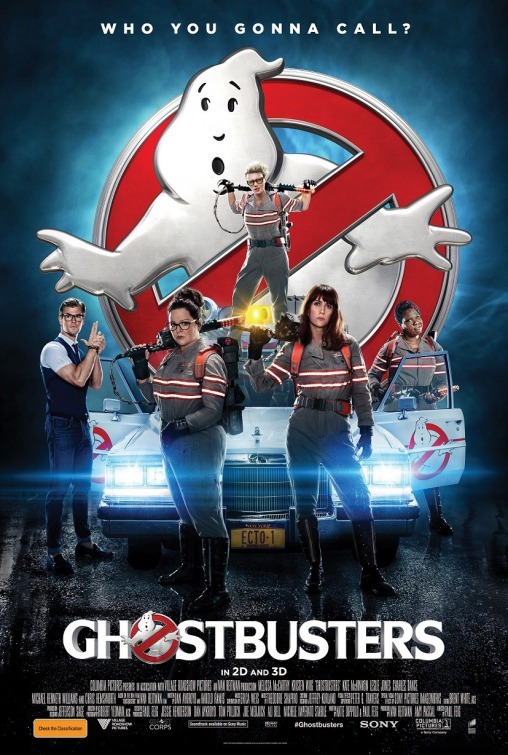 If you have time, I highly recommend seeing Ghostbusters on the big screen. You will not be disappointed. Also, stay through the credits to watch the bits and pieces of music video-like scene that didn’t make it into the movie. Hilarious! I had the distinct pleasure of getting to play the tabletop roleplaying game, Masks, over the weekend. I had backed the Big Bad Con Kickstarter at the Grandma’s Cottage level. This included a lot of stuff. One of those things was to participate in an online game with the designer, Brendan Conway. The reward did not mention the name of the game but I am always happy to give a new game a try. 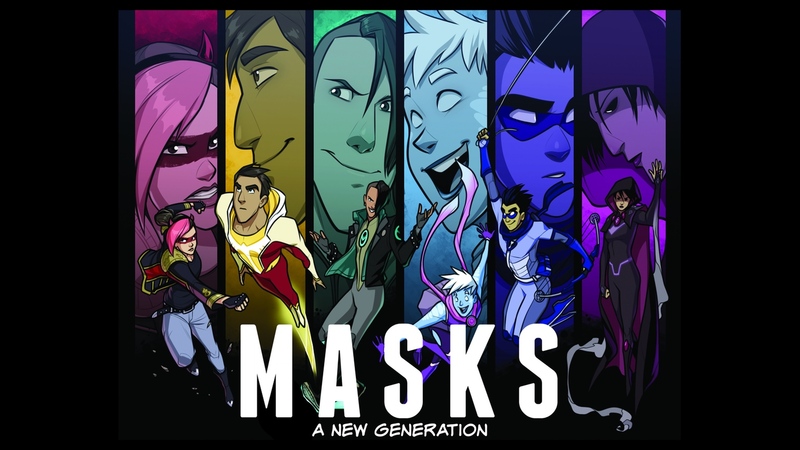 A few emails later and I discover that our small group would be playing Masks, a superhero game that uses the Apocalypse World game mechanics. I was a happy camper. 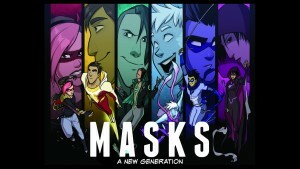 I love superheroes and Masks focuses on those heroes that are similar to the Teen Titans. After reading more about the game online, it felt more like the Teen Titans from the Wolfman and Perez era. It was a wonderful session with just three players and the designer running us through an opening scenario. 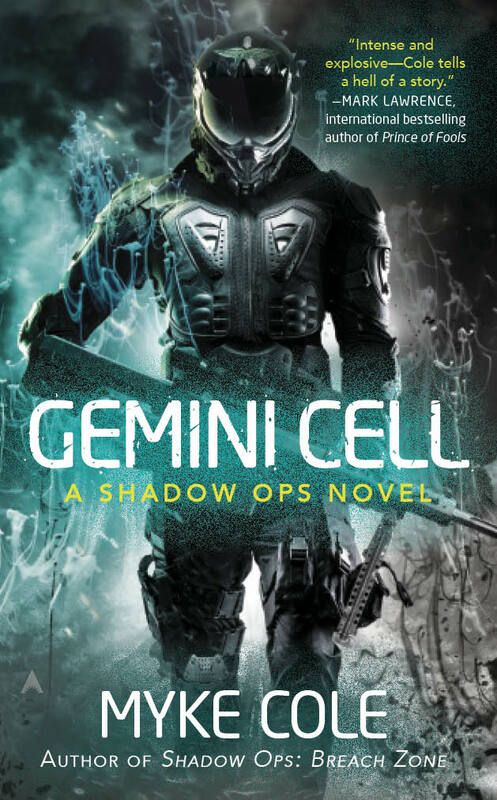 I will lead off that I am a bit biased when it comes to games that are Powered by the Apocalypse. The way the rules work from the fiction is something I love and will always give a game using this system a chance. Masks does an excellent job of using this rules system to bring the superhero genre to life. The dice mechanic is simple. Throughout play, your character is interacting with other players and NPCs. When you do or say something that can be interpreted of one of the Moves of the game, you will read the move, roll the dice, and then take further action based on the results. There are basic moves like Unleash your powers or Take a powerful blow. Each move lists what in the fiction would trigger it’s use and what stat you would add to the roll. You will then roll two D6 and add the appropriate stat. 6 or less and the Gm gets to determine what happens. 7-9 is a considered a hit and has a list of possible results that you get to choose from. 10 or more normally has an even better result. The stats are the interesting part of Masks. You have your labels which take the place of things like strength, dexterity, and intelligence. These labels are things like freak, mundane, superior, danger, savior. These each represent how a character views themselves. If the view themselves as freaks, they will be better at unleashing their powers but may not see themselves as mundane. This will make it difficult for them to interact with normal people and connect with their teammates. These stats are fluid throughout the game as how your character views themselves is easily changed by the views of those they value and the adults around them. Influence is the mechanic that allows for this fluidity. If a character has influence on you, this means the things they say can change how a character views themselves. Enough praise from an adult about being a savior, can push a low savior character to seeing themselves more like that. While an off hand comment by a valued teammate can leave a character not feeling very mundane but more of a freak. This along with the labels does an excellent job of capturing the feeling of comics featuring teenage superheroes. Like other powered by the apocalypse games, the characters are set up around iconic characters from the genre. There is the Bull, the Nova, The Outsider, and so forth. Each of these Archetypes comes with a set of moves and mechanics that are specific to them. The Bull has the Love and Rival mechanic. This provides certain mechanical benefits centered around two different characters at the table which pushes the player of the bull to be involved with these two players throughout the game. Each character type has this baked in to be a driver for their interaction with the world and the other players. I have to say that I really enjoyed Masks. It takes a genre that I enjoy and makes it something that is quick and easy to play while still having a depth of character and interaction that I crave. I appreciated that it took very little time to grasp the core rules behind the game and that it takes no time at all to customize a playbook to be what you really want. The moves do a wonderful job of creating the atmosphere that you would find in Teen Titans and the earlier Legion of Superheroes. I am always nervous and quiet around new people and I feel like I got into the game much more quickly than I would have with any other supers game. The people at the virtual table were a joy to play with on top f everything and Brendan did a wonderful job of getting us up to speed with how things worked and ran a great game. A definite four bears paws out of four for Masks. My only complaint is that it isn’t available yet and when the Kickstarter was live that I did not have the money to be a backer. Brendan did say that we may see it available for purchase at Big Bad Con so I will keep my fingers crossed and cash ready to purchase this excellent game. Here is the video of the game! I listen to Funny Books with Aron and Paulie and heard them talk about the Rebirth edition of Detective Comics. Their glowing review peaked my interest. I had another friend talk to me about the upcoming Batman stuff which pushed me over the tipping point and picking up issue 934. The issue starts with a bang. It presents us with imagery of Batman beating down Azrael in his own church. The fight is quick and brutal but is interrupted by the arrival of…Batman. When Batman asks Azrael who did this to him, he does not like the answer. Cut to BatWoman swinging across Gotham. After arriving home and unsuiting, Batwoman is visited by Batman. He wants her help. Whomever is masquerading as him has been watching the vigilantes of Gotham. The younger generation of heroes in Gotham are not prepared for this and he wants Batwoman to train them, prepare them. What follows is quintessential calling of the heroes. 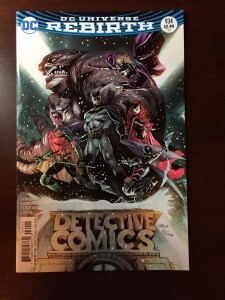 Batman and Batwoman gather up the Red Robin, Spoiler, Orphan, and Clayface and begins to train them to better survive the coming confrontation. There is so much to love about this book! The art is gorgeous. The two pages of Batwoman swinging across gotham is a sight to behold. The sense of action is well done, the attention to detail on her costume is nice. I love the background as well with the dirigibles and the bat signal playing across the old style buildings of Gotham. Another good example of this is the page where Batman and Batwoman have gathered all the players together. The two flank the bat signal as the large page with three panels inset showing the faces of the new recruits as they are given the spiel of what is about to happen. Simply stunning. The story is wonderfully as well. One of my favorite parts is the meeting in Batwoman’s place. I like that Batman has come to her for help. He points out what he has discovered and the need for training the other vigilantes of Gotham. Batman has to reassure Batwoman that he does not mean her and admit that he does not have the skills necessary to train a group of people. When Batman removes the cowl to show how much he trusts her, I love that she already knows. I also love how they bring Clayface into the group. He is sitting in a theater watching one of his old movies and lamenting everything he has lost. The two offer him a way to regain some of what he lost. The catch? He just has to do what they say. This is a story that is definitely in my wheelhouse. I like the idea of following Batwoman as she works with the next generation of heroes in Gotham. I like the idea of Clayface working towards redemption. I appreciate a bat book that takes the disparate characters that populate Batman’s world and puts them into something that resembles a team. I love that the lead in this book is Batwoman and she is being written as smart, aware, and powerful. 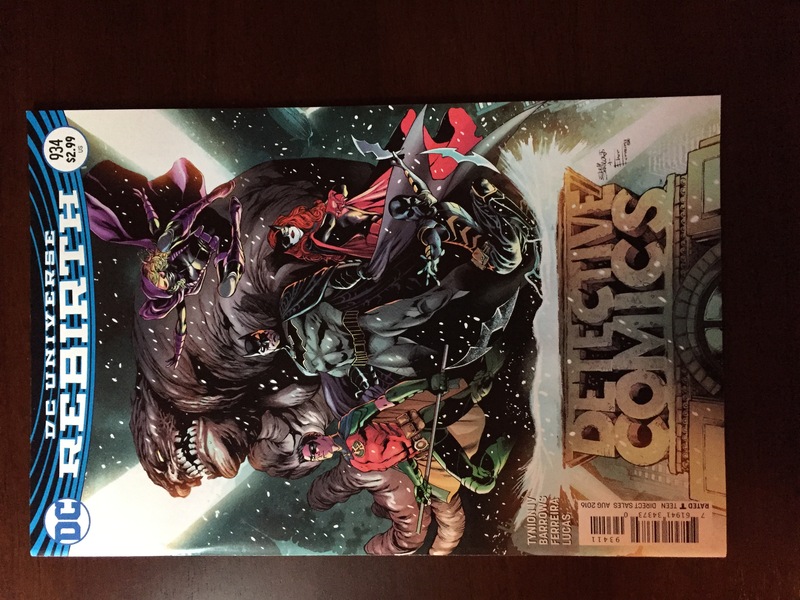 Detective Comics issue 934 gets four bear paws out of four from me. Great art and a wonderful story with interesting characters. I am looking forward to reading the next issue!